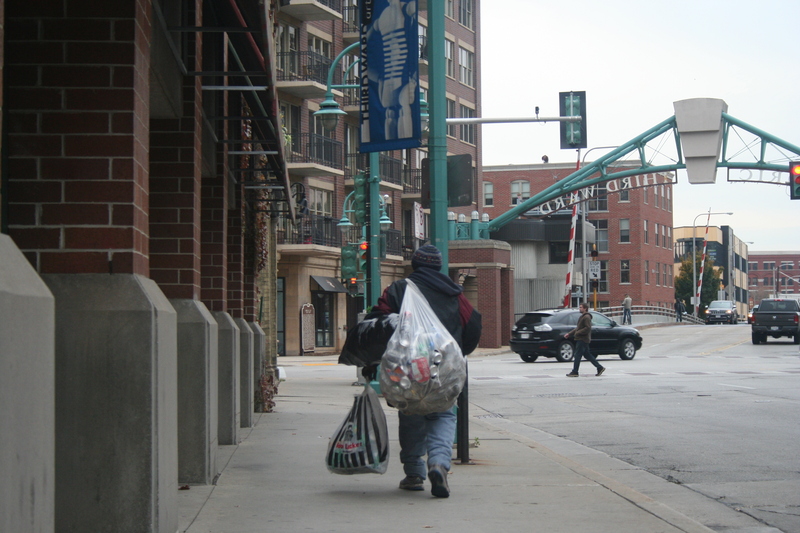 Willie Whitehorn walks down Chicago Street in Milwaukee’s Historic Third Ward on a cloudy afternoon toting three oversized plastic bags, filled to the brim with cans. Whitehorn, a man of modest height and weight, despite the appearance of his baggy coat, stops on the corner and stares through his sunglasses at a young woman crossing the street. Nodding in approval, Whitehorn turns and answers an un-posed inquiry matter-of-factly. “I’m a girl-watcher,” he says. Whitehorn says he grew up in Nashville, Tennessee, but that he doesn’t remember much from that time. “I was young, I was young, I was 9 years old when I came here,” he offers, in a barely-recognizable drawl. Did you find value in Willie’s story? If so, please subscribe to our newsletter; we publish the story of a different Milwaukeean every week.